"Train up a child in the way he should go; even when he is old he will not depart from it". Starfish Kids is a child evangelism ministry of One Mission Society working directly with the OMS-related Emmaus Fellowship of Churches. Through student sponsorship, Starfish Kids makes it possible for Haitian children to receive a Christian education to hear the Good News of Jesus Christ, reaching more than 800 students in over 30 schools. FIND RESOURCES AND ACTIVITIES FOR YOUR KIDS, AT STARFISH KIDS FOR KIDS! An older man walked along the beach one morning. He saw a young boy picking up and throwing things into the ocean. The older man approached the young boy and asked, "what are you doing?" The child replied, "Throwing starfish into the ocean. The sun is up, and the tide is going out. If I don't throw them in , they'll die." Full of frustration the older man answered, "but, young man, don't you realize there are miles and miles of beach and starfish all along it? You can't possibly make a difference!" The young boy listened politely, then bent down, picked up another starfish, and threw it past the breaking waves. He then turned back to the older man, and said, "it made a difference for that one". -Pray for their educational and spiritual growth. -Attend Sunday School and church regularly. -Attend school regularly and do their homework. -Maintain a good grade point average. -Pray for their student's educational, physical, and spiritual needs. -Give $25/month or $300/year sponsorship. This gift supplies the child with tuition and books as well as helps with teacher salaries. -Send letters and small gifts to your sponsor child when you wish. -Support their child by ensuring they attend school and church regularly. -Provide school uniforms and shoes. -Attend academic, mentoring, and spiritual training workshops. -Begin each school day with the children in God's Word and prayer. -Pray for their students, schools, teachers, communities and churches. -Lead Bible classes for the students. -Disciple and train students in the Word of God. -In charge of preparing attendance records and sending them to Starfish Kids Staff. -Prays for the students, sponsors, teachers, pastors, churches, and families, who all partner together in the Starfish ministry. -Manages the distribution of school books and tuition to the pastors for sponsored students. -Maintains accountability through regular financial tracking. ​-Holds teacher training to better equip teachers. Thousands of Haitian children need prayer and financial support. For less than $1 per day, you can make a difference in a child's life. To Sponsor a Child today, please click HERE, or call the OMS Office! There are other ways to donate to Starfish Kids, please click below for more information! Donate today to help provide schools with chalk boards and school supplies for the children. You will also help with the teacher salaries. 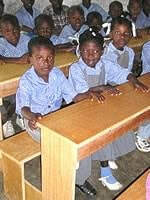 Provide necessary seating for students in cooperation with the Starfish Kids child evangelism ministry.